Unfortunately, there are many people who share this opinion. They view trade as a zero-sum game. if China wins, America loses. However, they are gravely mistaken because Sino-American trade has benefited both economies. For instance, before opening up its economy in the late 1970s, Chinese foreign direct investment to the U.S. was zero. In 2014, it was $12 billion, according to the Rhodium Group, a consultancy. 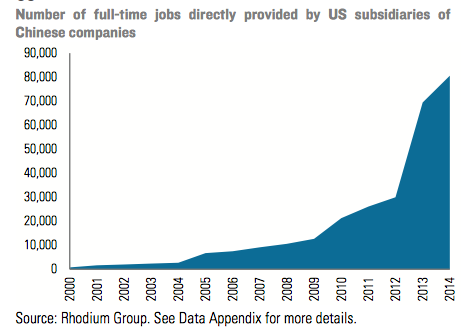 As the graph below illustrates, Chinese FDI also support more than 80,000 well-paying jobs in the U.S.
Ironically, most of the cheap Made in China products that Theroux criticizes so much help Americans afford a decent living. In addition, a Made in China t-shirt has cotton farmed in Mississippi with American-made Deere tractors with the help of cheap credit thanks to Chinese purchase of US treasuries, etc… Even an Iphone 5 assembled in China has more than 95% of components made by US and other OECD-headquartered firms, as shown below. So, Instead of abhorring these cheap Chinese made products, we should be lauding these companies for extending their supply chains and providing jobs to the “Bottom Billion“, who needs it the most. The strategy of getting rich on cheap labor in foreign countries while offering a sop to America’s poor with charity seems to me a wicked form of indirection. If these wealthy chief executives are such visionaries, why don’t they understand the simple fact that what people want is not a handout along with the uplift ditty but a decent job? Yes, American workers want jobs instead of handouts, but we live in a global economy, where countries and workers compete with one another in the market place. Given China’s large unskilled population, 21st century United States cannot compete with China in this area (low-skill manufacturing). As Chinese labor cost increases, however, some companies are “reshoring” or going elsewhere to search for opportunities to provide low-priced products to consumers and maximize profits for their shareholders. Are there people and communities in this country hurt by outsourcing jobs to China? Affirmative. However, there are many jobs that have been created downstream and upstream thanks to trade and investment between the two largest economies. More important, we live in a better world with a stable and middle-income Chinese economy than a poor and unstable one. 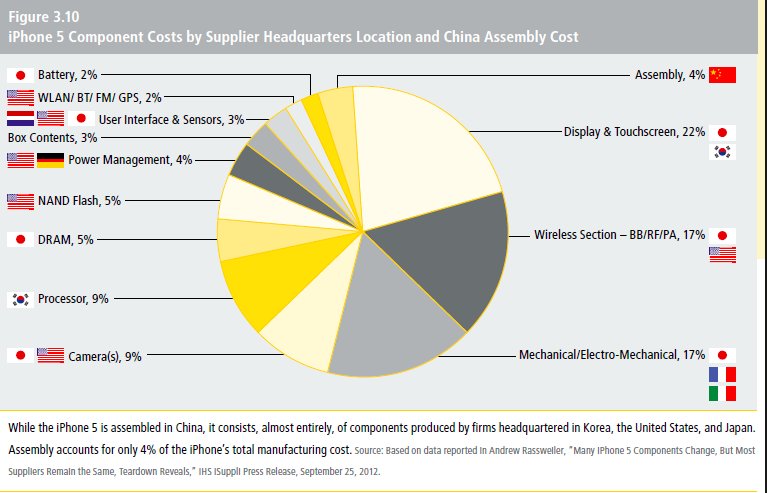 Also, as the world’s factory, China has to import most raw materials, components, and other inputs. So, to say that outsourcing jobs to China is bad for the U.S. is one-sided and untrue, because it obfuscates the true nature of today’s globalized economy.